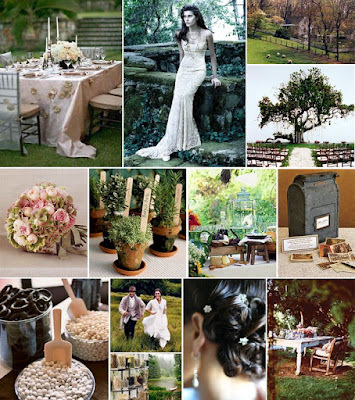 I know I promised more wedding inspiration boards from Snippet and Ink, so here they are! Kathryn really is an artist when it comes to encompassing an entire emotion with one lovely collage. We thought it would be fun to rename these boards after flavors that felt most appropriate for what we were eating up, visually speaking. This Board feels like Uptown Mojito-the white is so fresh, and the lemon/lime is simply refreshing! 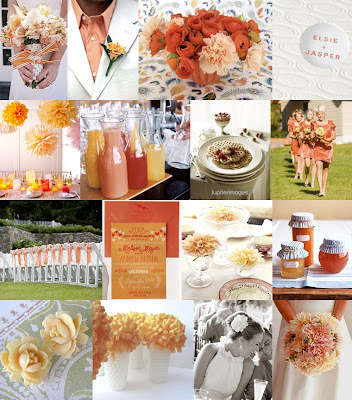 These colors are so summery and yummy-marmalade, passionfruit and summer peach! Southern Comfort...with a splash of honey and homemade vanilla bean ice cream. Wedding Music is often overlooked or a last minute decision, if it's made at all and not left to the hired pro's who will be handling it. When I was planning my own wedding, I had a great deal of help from a tried and true professional wedding musician-my mother Ginny, who had been playing piano and organ professionally since she was 14. She sat with me by the piano, with a mountain of Piano books and started playing all the familiar, classical standards. Debussy, Wagner, Handel, Vivaldi, Mozart.....but none of them seemed to fit. I wanted a song that felt like Nic and me, that reflected our personalities, and that would emphasize this monumental event in our lives. So I chose Elfman, Danny Elfman, specifically the Ice Dance Finale from Edward Scissorhands. It was beautiful, haunting, theatrical and absolutely perfect. When I played it for my mother for the first time, she actually cried, and through her easy-come tears (she cried at everything from fittings to cake choices to Bridal shows on Lifetime) she whimpered, "It sounds like the two of you." And that meant something special. So my advice to every bride is to take as much time choosing your ceremony songs and first dance music as you do your dress, because it's just as important! We'd love to hear some of your wedding soundtracks, First Dance Songs and the like-and why you chose them, so leave us your comments! One of the best things about getting married is sharing it with your closest friends. Most of the times, those dear friends are also enlisted to be bridesmaids (unless you are me, and decide to keep it small with only 30 guests). So it's a relief to live in the day and age where fashion has become a vital part of wedding planning, and being a bridesmaid is no longer a gut-wrenching trial of true friendship, all because of some horribly tacky dress that you wouldn't want to-and really don't know where you would-wear it again. These fabulous pink hued dresses could be a reason your friends clamor to be a part of your wedding. Designers include Tracy Reese, Adrianna Badgley Mischka, David Meister and BCBG, Aside from showing up naked, the bridesmaids could never steal the brides thunder....but these dresses will sure make them say "I Do" to being your Bridesmaid! Snippet and Ink has done it again! 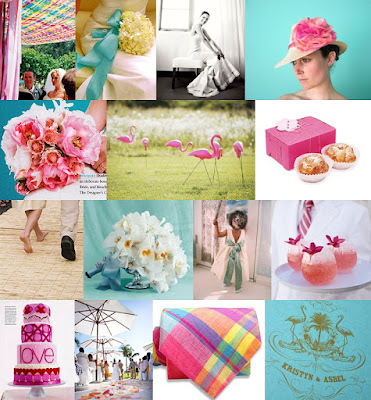 Check our the Charcoal and Aqua Inspiration Board from Master Wedding Stylist Kathryn at Snippet and Ink! 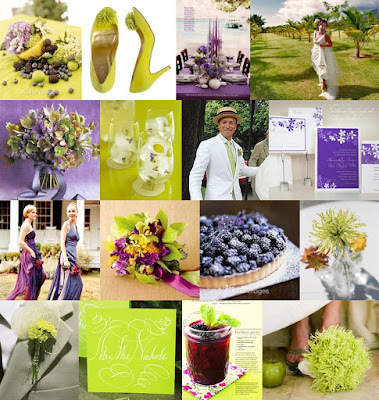 This Board is so luscious and sophisticated, and the color palette is so beautiful, it would work for any season! 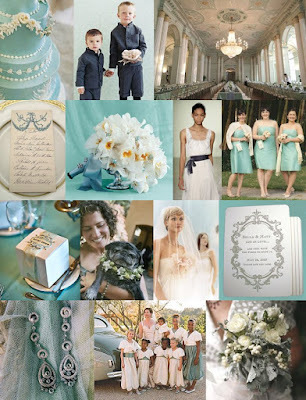 Kathryn's palette of charcoal, dove grey, and pale baby blues, aqua and cyan are a match made in color heaven! It looks like Grey is the new Chocolate-and we're loving it! We recently designed a very fun, art-deco inspired suite for a wedding in Baltimore. The main source of inspiration? The landmark Senator Theater in Baltimore. With a cool grey and seafoam color palette, we got to work designing a really fun, retro suite that's as spunky as it is cool! We also just realized how perfect this suite would be with any of the Gunmetal Bridesmaids Dresses! We'll have to get to work on a Gotham Grey Inspiration Board! The term "fierce" really describes these stainless steel inspired frocks. From haute designers Badgely Mischka, Melissa Sweet and the always flawless Armani (on the gorgeous and freakishly talented Cate Blanchett) to less expensive alternatives from Thread and Anthropologie, these colors are redefining what it means to be neutral. Pewters, Platinum, Gunmetal, Steel, Smoke and Cement-there are many shades of grey that are perfect for a wedding day or a party where you want to make a subtle statement of truly sophisticated style. 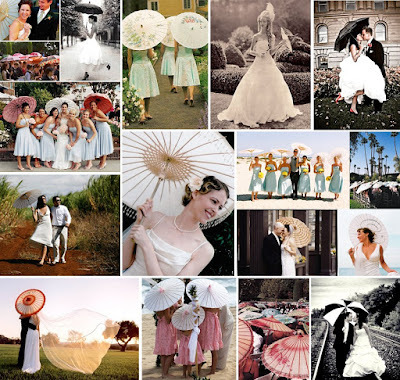 We're starting our Wedding Trend Lover posts with one of our favorite wedding accessories; the parasol. It's whimsical, it's delicate, it's show-stopping, it's individual and it's practical and functional! We've noticed more and more parasols popping up all over wedding editorial, from Martha Stewart and Brides, to some of our favorite wedding blogs! We're also listing some of the great resources for buying or renting parasols for your big day! Bella Umbrella is the source for some of the most beautiful parasols and vintage umbrellas you'll ever see-a perfect place to start! if you have any other parasol/umbrella resources, leave us a comment! One of the lovelier, simpler things in life has to be chocolate. But chocolate can also be a sweet saboteur of diets and a healthy lifestyle. And let's face it, it's impossible to eat chocolate in moderation, considering moderation usually amounts to "a Hershey kiss". Well, I've got a wonderful and healthy alternative for those of us who want to have our chocolate cake-like-treats and eat it too! VitaMuffins. Specifically, Deep Chocolate VitaTops. The products are very low in fat, 100 calories, high in fiber with a decent amount of protein, and 50% of many of your daily vitamin requirements. And, they don't have the dreaded chocolate substitute after taste. Don't get me wrong-it's not the same as eating a slice of Mom's homemade (or out of a box) chocolate cake, but it's pretty darn close, and for what they are, they are really delicious! 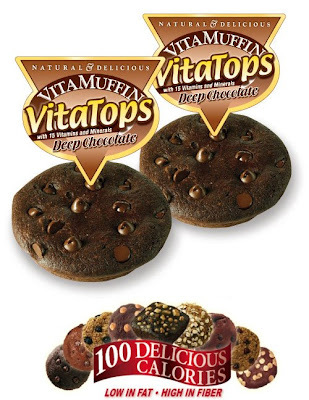 The Vitalicious brand boasts a number of VitaMuffins, VitaTops, and VitaBrownies. Some of the Muffin and Top flavors include Blueberry, Corn Muffin, Cranberry, Chocolate w/Peanut Butter Chips, Cranberry and Bran, not to mention a slew of chocolate variants! These designers soaps from Claus Porto have fast become a favorite of all of us around here-Not only are they luxurious-milled 7 times-but are also gorgeous on the outside, wrapped in extraordinary paper featuring really cool graphics. These would be great gifts, especially for bridesmaids, mommy's to be, and anyone who can appreciate luxury skincare as well as a really great design. Claus Porto is perfection on so many levels! 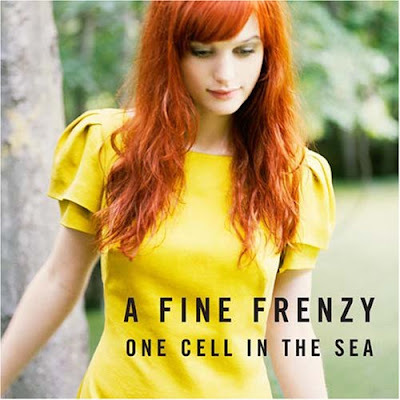 I've been listening to A Fine Frenzy's debut album, One Cell in the Sea since it came out about a year ago, and it's fast become one of my absolute favorite albums. Alison Sudol, the musician behind A Fine Frenzy, has an inviting, wiser-than-her-22years talent for lyrics, and the music behind it is really beautifully haunting. Being one of the many who only listens to the radio for traffic reports, this album is in constant rotation in my changer and on my ipod (phone and shuffle) and for those of you who haven't heard of A Fine Frenzy yet, get the album, you won't be disappointed, and you can thank me later! 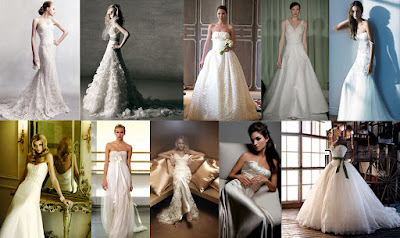 Some are old, some are new, but they are all our favorite wedding dresses of the past few seasons, and we think they are timeless, unique and just all out gorgeous. Let us know which one is your favorite! 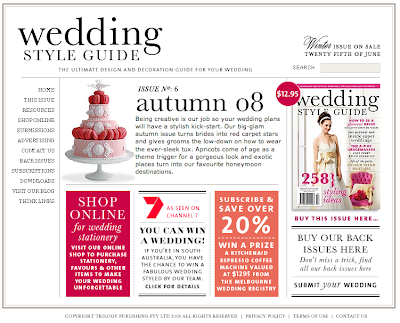 If you haven't heard already, you should definitely check out the Wedding Style Guide (http://www.styleguide.com.au/) it's just the most wonderfully clean and simply designed wedding resource site we've ever seen! It reminds us a little of the design we did for hubby Nic Nichols (nicnichols.com). The site is easy to navigate, with great, simple inspiration. The pub kinda reminded us of New Beauty, that cutting edge beauty book that is redefining the way we leaf through a magazine! 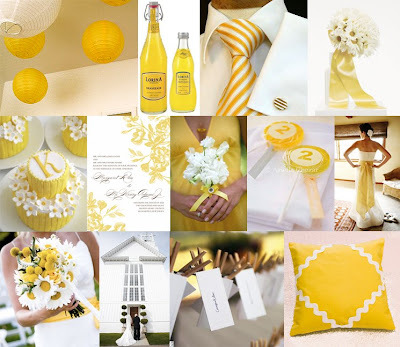 Although the Wedding Style Guide is Australian based, we know you'll agree that it's sure to be added to the Divine Library of Wedding pubs, up there with Martha Stewart Weddings, Brides, Inside Wedding and Grace Ormonde! 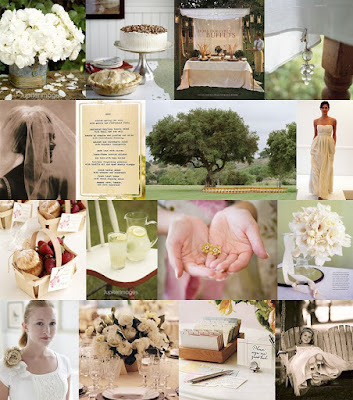 I just can't get enough of the gorgeous inspiration boards from the amazing Kathryn at Snippet and Ink! Here are some of our favorites for summer! 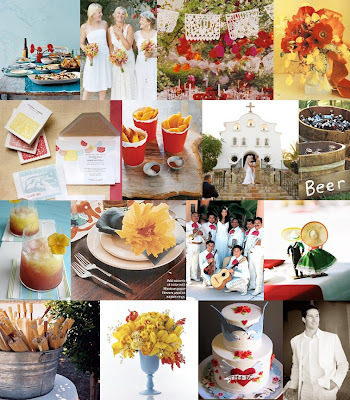 We'll post more inspiration boards as the month continues so check back! It's no big secret that I'm a cat lover, but in my quest to find things for Gracie, I'm having a really hard time finding cat-specific goods that aren't generic or overly cutesy. We find a ton of stuff for our pit-bull Harley, but sadly, not so much for sweet little Gracie. 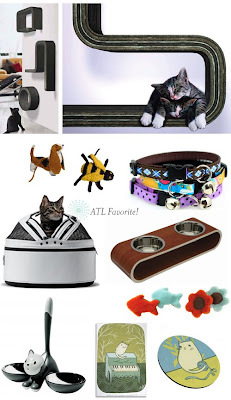 I was really happy to find ModernCat.net, a site devoted to trendy, modern cat goods. They've got great links to all sorts of really fab feline finds. The Meow-me sleeper pod and carrier is sweet, and the toys from George are so unique! My brother and sister-in-law are expecting twins this fall, and since we just found out they are having twin boys, we're now starting to look for some baby gear. Some of the coolest, most modern & innovative babywares can be found at Genes Urban Baby Boutique. 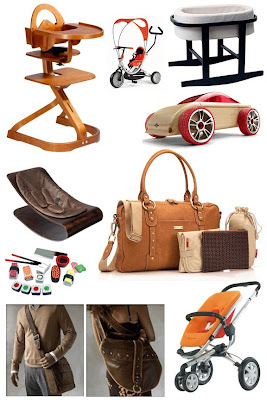 For parents who like a little more modern and edgy style, this place has baby bags for Moms & Dads that follow fashion and function, ridiculous toys, minimalist furniture and so much more-we especially loved the plywood high-chair-very cool, and the wooden sports car-it's only $36! I've been searching everywhere for the Kate Spade Peacock Cosmetic Case, and sadly, I must've waited too long, because I can't even find the thing of ebay! As luck would have it, while scouring for the peacock bag, I stumbled upon Stephanie Johnson's site and immediately took to her amazing variety of bags! 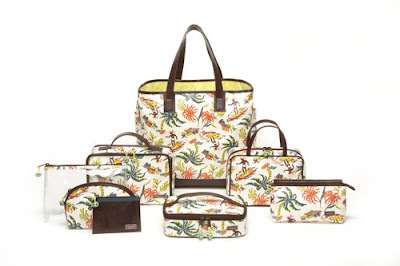 I'm thinking the Waikiki would be a great substitute for the bag I originally wanted. It's fun, colorful and will get the job done. The only problem is picking which bag or bags I actually need, since I'm sure I could find a use for them all! 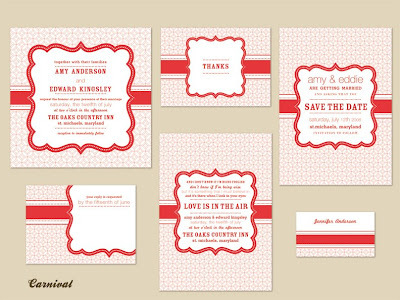 Frontier Garden is really the start of Milkmaid Press, since it's the suite I designed for my very own wedding! We knew we wanted a small, intimate wedding in the spring, outside in a quiet, green meadow, and a fun, relaxed reception to follow. Our colors were chocolate, spring green, pale pink and ivory, and we wanted a rustic, vintage feel that wasn't too serious, since, I am after all, a country girl at heart! My gown was a strapless, ivory lace A-line, and i wore delicate Siman Tu Jewels, in addition to my size 4 wedding rings! 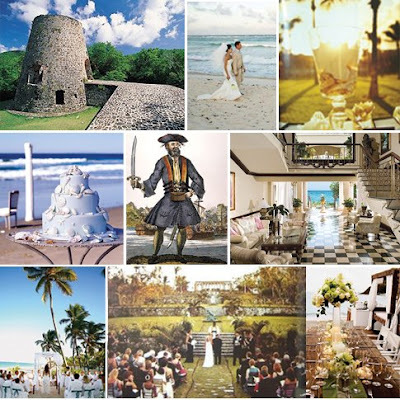 The ceremony and reception site were the same (I highly recommend doing this-it makes life easier on everyone! ), and it was the Cameron Estate Inn, a historic Bed and Breakfast in bucolic Mount Joy, PA. Our ceremony was outside, near the ruins of an old stone barn, next to a stream. We had originally wanted to have an outdoor reception, but the weather reports of thunderstorms forced us inside their cozy, beautifully decorated dining room-which happened to share our colors and vintage chic theme! Fragrant pink garden roses were potted in moss covered pots and decorated the tables, along with lots and lots of candles. We had giant apothecary jars filled with chocolate covered pretzels and other treats as favors, and the vintage ribbon from my bouquet was used throughout the reception to tie everything together. We had one of our vintage polaroid cameras outside on the porch for portraits, which we chose in lieu of a guestbook since we are both photographers. EMD dj'd, and everyone went outside after the short spring showers to have their portrait taken, dance, drink and enjoy in the general merriment of the day! 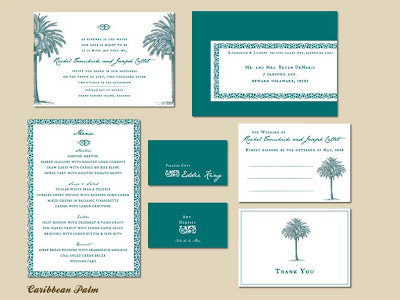 Probably our most popular design, Caribbean Palm, was designed originally for a good friend, who when asked what she wanted, replied "Well, we're getting married in the Bahamas, and I like the idea of a Pirates of the Caribbean feel-that kind of colonial elegance with a touch of fun", and Caribbean Palm was born! Those who know me, know I'm a simple-jewelry-kind-of-gal. I don't like anything too big or flashy, and tend to believe that less is more when it comes to the matter, so I was delighted to find a company that's making chic and delicate jewelry that is perfect for ladies like myself. I was introduced to Dogeared by my good friend and client, Madeleine Homes of La Papillion Spa in Timonium MD ( just outside of Baltimore). She carries the line, and I absolutely fell in love with the delicate necklaces, precious charms and sweet messages. My favorite is the Karma necklace dipped in gold, but I wouldn't mine one of each they are so adorable! They make great gifts-and the house blessings are especially cool! 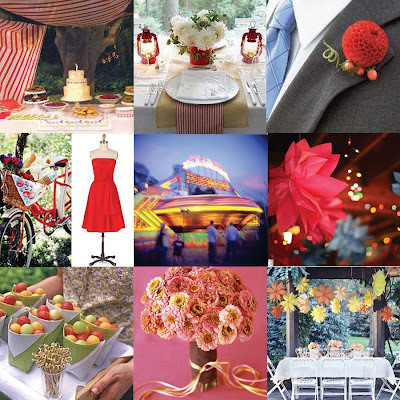 At Milkmaid Press, we recently designed a carnival picnic inspired suite for a wedding on the lovely Eastern Shores of Maryland. 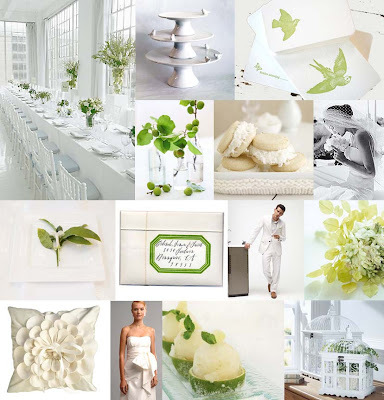 Here is the Inspiration Board for that wedding suite, featuring imagery from Martha Stewart, Brides Magazine, The Knot, and documentary photographer (and my husband and the only man among the maids)Nic Nichols. 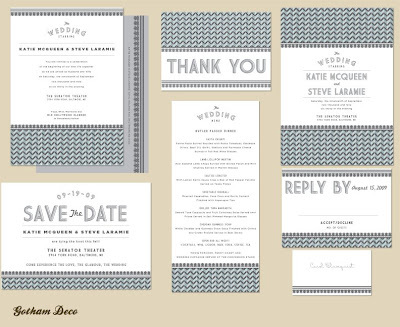 We were also lucky enough to be featured on our good friends blog, iloveletterpress.com! thanks to them for the feature! 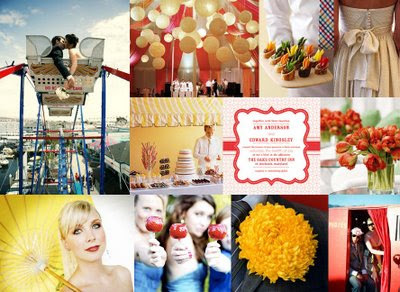 Here's an inspiration board we found that features Carnival, and i LOVE the pictures for this one! Carnival's admirers are growing every day, so thank you so much for spreading the word!